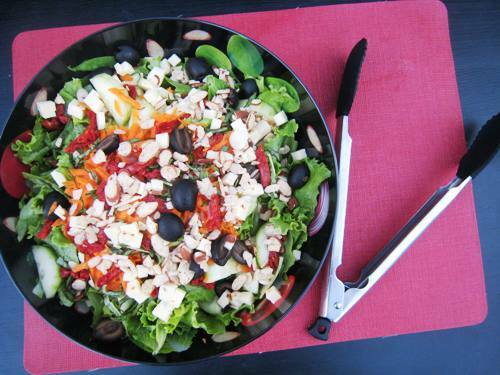 A salad made on the spot can be tasty, using whatever you’ve got in the fridge. This unlikely combination of sun-dried tomatoes, shredded carrot, sliced cucumbers, sliced almonds, and black olives surely proved itself. Despite my bigger grocery budget this week (in comparison to the next two weeks’ Pantry Challenge budget), it has felt like the Challenge has already begun. Since I put the produce box “on vacation” this week, we worked through our supply of fruits and veg pretty well this week. The refrigerator is starting to look a bit bare. I see white! So, on the fourth when I went to make a salad, I found myself at an impasse. Hmmm…. what can I put in here? The lemons were gone so I couldn’t make a Caesar Salad like I had planned. Instead I made this concoction. It isn’t too crazy of a combination, but it was definitely outside the norm for my family. I was curious what FishPapa would say. I just kept quiet and waited. Yes, it does work, despite the unconventional cast of characters. The carrots and sundried tomatoes add sweetness; the pepperjack contributes heat; the cucumber and almonds add a bit of crunch. It all works quite well, worthy of repeating again. Sliced steak or tri-tip goes exceptionally well with this salad. 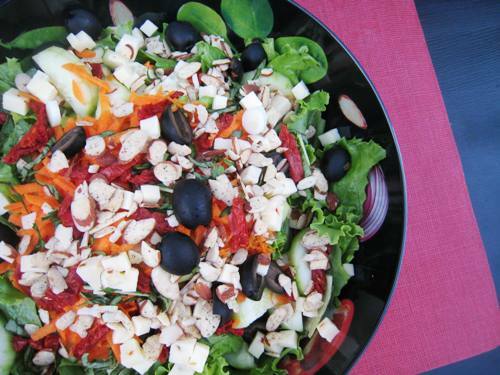 In a large salad bowl combine the lettuce, cucumber, carrot, cheese, tomatoes, olives, almonds, basil, scallions. In a small jar combine equal parts oil and vinegar. Shake well to combine. Allow diners to serve themselves, serving the dressing and salt and pepper on the side. What a beautiful salad! I love finding new ways to serve salad!